Hello, Hula: Can Russ Scully Create a Lakeside Tech Scene? If you're looking for "I Spys," dating or LTRs, this is your scene. GROUPTHINK Individual ambitions threaten a tight-knit improv troupe in Birbiglia’s wryly funny tribute to the form. Stories of show-biz rivalry are nothing new at the movies, given that it's a topic with which their makers are painfully familiar. But there's a unique poignancy to setting such a story in the world of improv comedy, because it's one of the most group-oriented artistic pursuits there is. While standup comics face the audience alone, improv teams are built on relationships of mutual support, on the assurance that each player will say, "Yes, and..." to the split-second impulses of the others' imaginations. In improv, as an instructor tells students in writer-director Mike Birbiglia's Don't Think Twice, bombing as a cohesive group is an honorable failure. Bombing as a bunch of attention-seeking individuals is just embarrassing. But what happens when the members of a close-knit improv troupe do, secretly or openly, crave a spotlight they won't have to share? Known for his standup and radio performances, Birbiglia (Sleepwalk With Me) also has experience in the improv world, and he brings nuance and respect to this story of one group threatened by a member's defection. Birbiglia stars as Miles, founding member of a six-person troupe called the Commune, whose members eke out an existence in the New York comedy scene. They're well respected enough that their shows draw scouts from "Weekend Live" (a ringer for "Saturday Night Live"). But several of them share a tiny apartment, and their grubby theater is about to close its doors for good. Younger team member Jack (Keegan-Michael Key) dreams of something more; when "Weekend Live" offers him an audition, he jumps. That doesn't sit well with Miles, who's already blown several such chances (he likes to tell his students he was "an inch away" from becoming a "WL" cast member). Jack's girlfriend, Sam (Gillian Jacobs of "Community"), also gets a coveted audition, but she's less gung-ho about leaving the troupe, wondering if success really means starring on a show that everyone agrees isn't all that funny. The Communards, some of them pushing 40, are facing that watershed moment when creative types decide whether it's worth it to keep pursuing a non-lucrative passion. Bill (Chris Gethard) is watching his father decline; Lindsay (Tami Sagher) is sick of living with her rich parents; Allison (Kate Micucci) wonders why she put aside her dream of being a cartoonist. Even Miles — who's made a habit of sleeping with his twentysomething students — is tempted by maturity. Not all of these characters are fully developed: Sam's motives, in particular, could have come into sharper focus. Yet their onstage rapport is always convincing. The rhythm of improv isn't easy to capture in a scripted drama; it's all too easy to portray a team as a bunch of oddballs trying to outdo one another in wackiness. But Birbiglia understands that grandstanding is actually improv's enemy. (When Jack shoehorns his Obama impersonation into a scene, trying to impress the scout in the audience, his colleagues shoot him a major side-eye.) During the Commune's shows, the camera stays onstage, moving fluidly from person to person as each takes his or her turn at bringing the scene to life. Although the improv is scripted, the stumbles and hesitations are realistic — as is the tendency of the Commune members to keep right on improvising offstage. 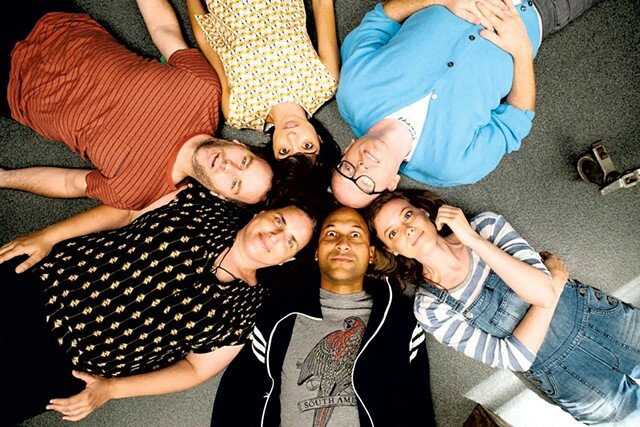 Don't Think Twice doesn't paint its characters as heroes or villains, or offer easy answers to their dilemmas; we see why a spot on "Weekend Live" is so coveted, and how it might be a comedown, in other ways, from the camaraderie these six have built over the years. A low-key drama and a surprisingly funny comedy rolled into one, Birbiglia's film suggests that improv and life have something in common: We're all making it up as we go. Got something to say? Send a letter to the editor and we'll publish your feedback in print! Don't Think Twice is not showing in any theaters in the area. Margot Harrison is the Associate Editor at Seven Days; she coordinates literary and film coverage. In 2005, she won the John D. Donoghue award for arts criticism from the Vermont Press Association. Keep up with us Seven Days a week!